While the former governor of New Mexico, Gary Johnson, still has little chance to be the Republican nominee, his zinger, “my neighbor’s two dogs have created more shovel-ready projects than this president” stole the show at last night’s debate. Both Perry and Romney did well in general. I wish Romney would stand up and be honest about the “RomneyCare” issue. He needs to admit it was a mistake, own it, and discuss lessons learned from it. Until he can do that, I just cannot get behind him as the republican candidate for president in 2012. Perry still needs to work on not “fading out” in the second half of these debates. He needs to maintain sharpness and focus, and show he will not “fade out” on the job if elected president. Apparently, Bernanke’s grand idea is to go back into the past, pick out some stupid idea that didn’t work then, give it some shiny new packaging, and watch everyone “ooh and ah” at the his brilliance. However, this is a dangerous gambit at best. Most experts say it will do no good … and, hopefully will do no harm. But in fact, it will probably make things worse. Basically, the “Operation Twist” involves selling short-term bonds and then buying long-term bonds in hopes of artificially reducing long-term interest rates. If successful, this policy (or so we are told) will incentivize more borrowing and stimulate growth. How well did it work in the 1960s when it was last used? At that time, the Fed was attempting to flatten out yield curves by raising short-term rates and dropping long-term rates. From 1961 to 1965, long-term rates didn’t change while short-term rates consistently rose. The plan failed because it was too small of an initiative and this type of artificial market manipulation is never truly effective. 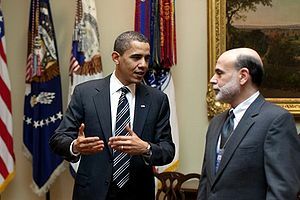 Bernanke’s version of “Operation Twist” is doomed to fail as well. There are two reasons recession is just around the corner. The first is that banks aren’t lending. They took their bailout money and are hoarding it. It doesn’t matter if interest rates are zero. If banks won’t loan money to consumers, no amount of stimulus funds will change things. The second reason is that consumer sentiment remains in the gutter. These measures could only be (at least artificially effective for the short-term) if consumers believe that this economic downturn is temporary. Any new-found money consumers can get their hands on will go to pay down debt or put into savings. People won’t be going to the mall on shopping sprees. This Wall Street Journal editorial covers the key points very well. The Fed announced that through June 2012 it will buy $400 billion in Treasury bonds at the long end of the market—with six- to 30-year maturities—and sell an equal amount of securities of three years’ duration or less. The point, said the FOMC statement, is to put further “downward pressure on longer-term interest rates and help make broader financial conditions more accommodative.” It’s hard to see how this will make much difference to economic growth. Long rates are already at historic lows, and even a move of 10 or 20 basis points isn’t likely to affect many investment decisions at the margin. The Fed isn’t acting in a vacuum, and any move in bond prices could well be swamped by other economic news. Europe’s woes are accelerating, and every CEO in America these days is worried more about what the National Labor Relations Board is doing to Boeing than he is about the 30-year bond rate. The Fed will also reinvest the principal payments it receives on its asset holdings into mortgage-backed securities, rather than in U.S. Treasurys. The goal here is to further reduce mortgage costs and thus help the housing market. But home borrowing costs are also at historic lows, and the housing market suffers far more from the foreclosure overhang and uncertainty encouraged by government policy than it does from the price of money. The Fed’s announcement thus had the feel of an attempt to show it is doing something to help the economy, even if it can’t do much. …the economy’s problems aren’t rooted in the supply and price of money. They result from the damage done to business confidence and investment by fiscal and regulatory policy, and that’s where the solutions must come. Investors on Wall Street and politicians in Washington want to believe that the Fed can make up for years of policy mistakes. The sooner they realize it can’t, the sooner they’ll have no choice but to correct the mistakes. Some “experts” are explicitly arguing in favor of more “quantitative easing” because they want some inflation. They argue that “moderate” inflation will help the economy by indirectly wiping out some existing debt. Letting the “inflation genie” our of the bottle can be very dangerous, however. …we are beginning to hear murmurings about the possible invigorating effects of “just a little inflation.” Perhaps 4 or 5 percent a year would be just the thing to deal with the overhang of debt and encourage the “animal spirits” of business, or so the argument goes. The siren song is both alluring and predictable. …After all, if 1 or 2 percent inflation is O.K. and has not raised inflationary expectations — as the Fed and most central banks believe — why not 3 or 4 or even more? …all of our economic history says it won’t work that way. I thought we learned that lesson in the 1970s. That’s when the word stagflation was invented to describe a truly ugly combination of rising inflation and stunted growth. …What we know, or should know, from the past is that once inflation becomes anticipated and ingrained — as it eventually would — then the stimulating effects are lost. Once an independent central bank does not simply tolerate a low level of inflation as consistent with “stability,” but invokes inflation as a policy, it becomes very difficult to eliminate. …At a time when foreign countries own trillions of our dollars, when we are dependent on borrowing still more abroad, and when the whole world counts on the dollar’s maintaining its purchasing power, taking on the risks of deliberately promoting inflation would be simply irresponsible. The weak economy calls for urgent action. The most effective answer is more robust stimulus — bigger payroll tax breaks, more infrastructure investment, bigger transfers to states and cash-strapped families — and more help for debt-choked homeowners. The only things standing in the way are Republicans with narrow political aims. No wonder I have given up on reading the New York Times. Is this editorial for real? What … do we borrow another couple of trillion dollars from China to do this? Why … because the last stimulus package worked so well? What the Republicans are finally gaining the “cojones” to stand in the way of is out-of-control government spending, insane borrowing practices, skyrocketing debt, and the progressive-liberals penchant for continually trying the same old failed policies, but on an even grander scale … which will only lead to even “grander” disastrous results.